Three rounds. Three strikes. Make it through this game, and it’s clear — you’re on to spam scams and not likely to get slammed by the next one. Unwanted commercial email – also known as “spam” – can be annoying. Worse, it can include bogus offers that could cost you time and money. Take steps to limit the amount of spam you get, and treat spam offers the same way you would treat an uninvited telemarketing sales call. Don’t believe promises from strangers. Learn to recognize the most common online scams. Check your email account to see if it provides a tool to filter out potential spam or to channel spam into a bulk email folder. You might want to consider these options when you’re choosing which Internet Service Provider (ISP) or email service to use. Your choice of email addresses may affect the amount of spam you receive. Spammers send out millions of messages to probable name combinations at large ISPs and email services, hoping to find a valid address. Thus, a common name such as jdoe may get more spam than a more unique name like j26d0e34. Of course, there is a downside – it’s harder to remember an unusual email address. Use good computer security practices and disconnect from the internet when you’re away from your computer. Hackers can’t get to your computer when it’s not connected to the internet. Be cautious about opening any attachments or downloading files from emails you receive. Don’t open an email attachment — even if it looks like it’s from a friend or coworker — unless you are expecting it or you know what it is. If you send an email with an attached file, include a message explaining what it is. You may find email messages in your sent folder that you didn’t send. the Federal Trade Commission at [email protected]. Be sure to include the complete spam email. Posted in Digital Literacy, GamesLeave a Comment on Spam can include bogus offers that could cost you time and money. 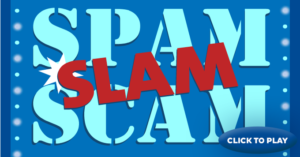 The USA’s Federal Trade Commission challenges teens to a digital literacy “game” of SPAM SLAM SCAM!